This kit is compatible with 65-73 Mustang, 63-69 Falcon/Comet (60-62 as well with 63-65 upper control arm replacement), 62-69 Fairlane, 67-73 Cougar, 69-77 Maverick/Comet, 75-80 Granada/Monarch, and some Torino. 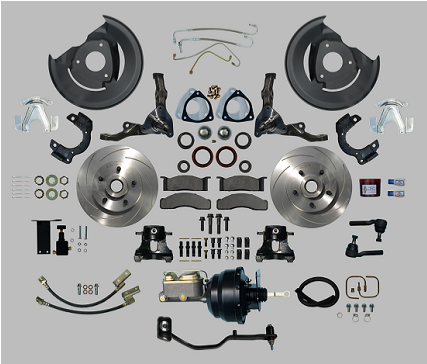 This kit includes new heavy duty Ford V8 spec disc brake specific spindles. Two spindles are available; one tailored for use on 64-66 Mustang and pre 66 Falcon/Comet/Fairlane, and the other made for later models of these cars. 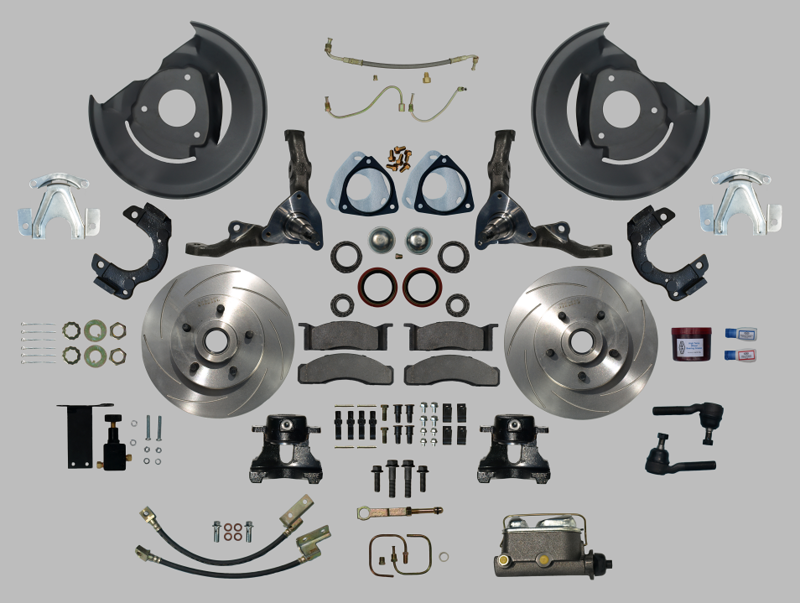 The kit includes everything needed to swap out your front drum brakes for disc brakes. All new parts including high strength alloy steel spindles, a brake dust/splash shield kit, corrosion protected caliper brackets, corrosion protected calipers, semi-metallic pads, rubber brake hoses, hose brackets and attachment hardware, adjustable proportioning valve with convenient mounting kit, master cylinder with residual pressure valve integrated into the rear brake circuit, an adjustable pushrod, wheel bearings, wheel seals, caliper attachment hardware, wheel attachment hardware, dust caps, performance slotted rotors with bearing races pre-installed, outer tie rods correct for your application, Grade 8 attachment bolts, medium and high strength thread locker, and high temperature wheel bearing grease. The kits now include preformed braided stainless steel and steel brake tubes that are necessary to plumb the under the hood functions of the master cylinder, proportioning valve, and distribution block. Note that your original 14" wheels WILL fit this conversion. S&H For reference only, the S&H will be calculated at check out. S&H are are based upon your State's shipping zone. See your State's zone on the chart below. 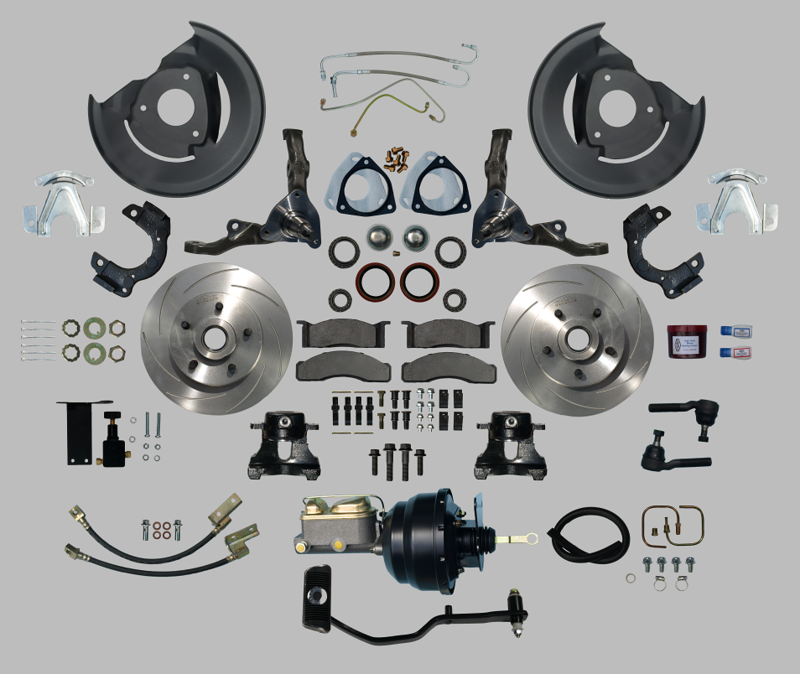 SWAP.3.3/M: 5 lug front manual disc brake conversion kit for 64-66 Mustang with V8 manual steering linkage. SWAP.3.3/PBU/AT: 5 lug front power assist upgraded disc brake conversion kit for 64-66 Mustang with V8 manual steering linkage and automatic transmission. Includes a power assist upgrade package. 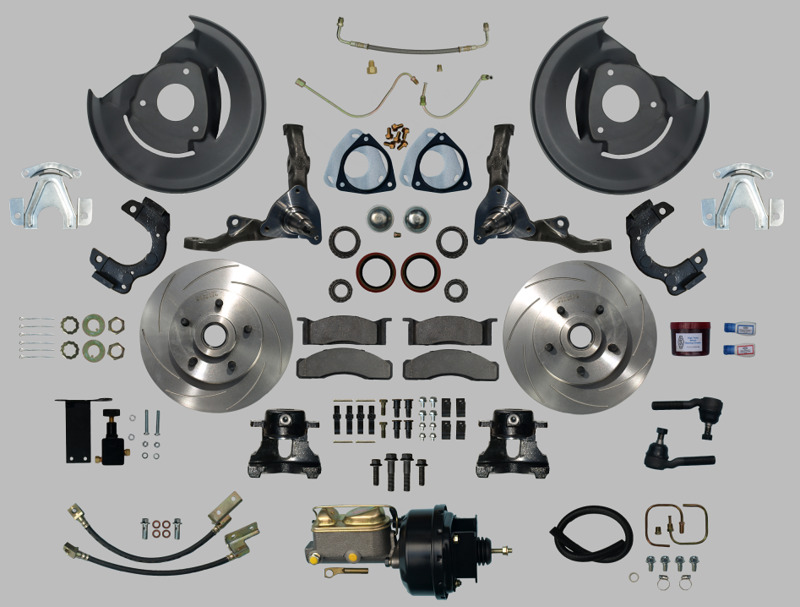 SWAP.3.4/M: 5 lug front manual disc brake conversion kit for 6 or 8 cylinder 67-73 Mustang with manual or power steering. SWAP.3.4/PBU/AT: 5 lug front power assist upgraded disc brake conversion kit for 6 or 8 cylinder 67-70 Mustang with manual or power steering, and AUTOMATIC transmission. Includes a power assist upgrade package. SWAP.3.4/PBU/MT: 5 lug front power assist upgraded disc brake conversion kit for 6 or 8 cylinder 67-70 Mustang with manual or power steering, and MANAUL transmission. Includes a power assist upgrade package. 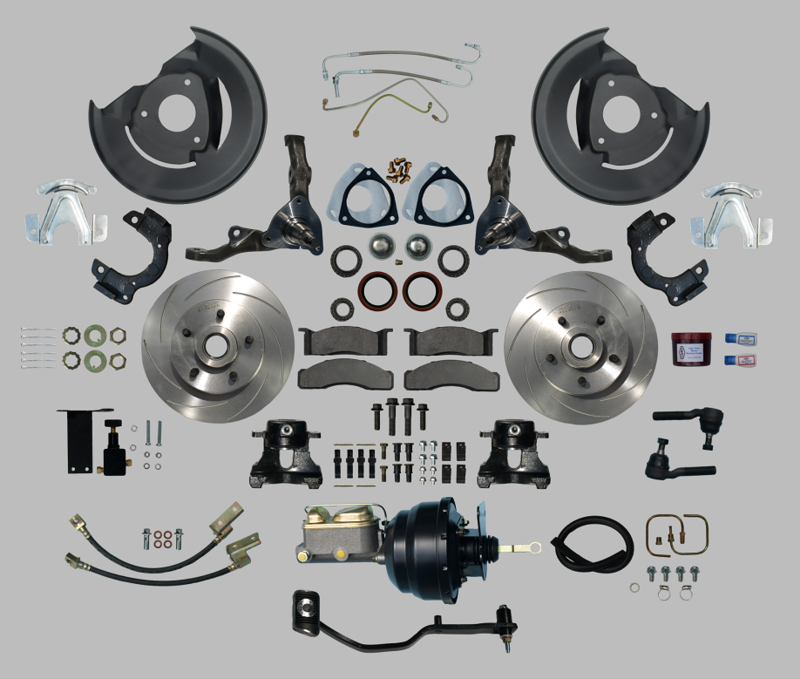 SWAP.3.2/M: 5 lug front manual disc brake conversion kit for 64-66 Mustang with V8 power steering linkage. SWAP.3.2/PBU/AT: 5 lug front power assist upgraded disc brake conversion kit for 64-66 Mustang with V8 power steering linkage and automatic transmission. Includes a brake power assist upgrade package. SWAP.3.5/M/SLU.M: 5 lug front manual disc brake and manual steering linkage upgrade for 4 lug 64-66 Mustang, Includes a complete V8 manual steering linkage upgrade package. SWAP.3.5/PBU/SLU.M: 5 lug front power assist disc upgraded brake and manual steering linkage upgrade for 4 lug 64-66 Mustang, Includes a power assist upgrade package. Includes a V8 manual steering linkage upgrade package. 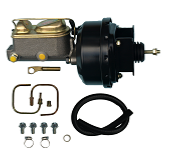 The 65.PBU power brake upgrade kit has all new parts including booster, bracketry, power master cylinder upgrade, hose, power brake pedal push rod, and hardware. The kit can only be applied to 64-66 automatic transmission equipped cars. This kit is shipped with no additional S&H charge when purchased with a SWAP kit. 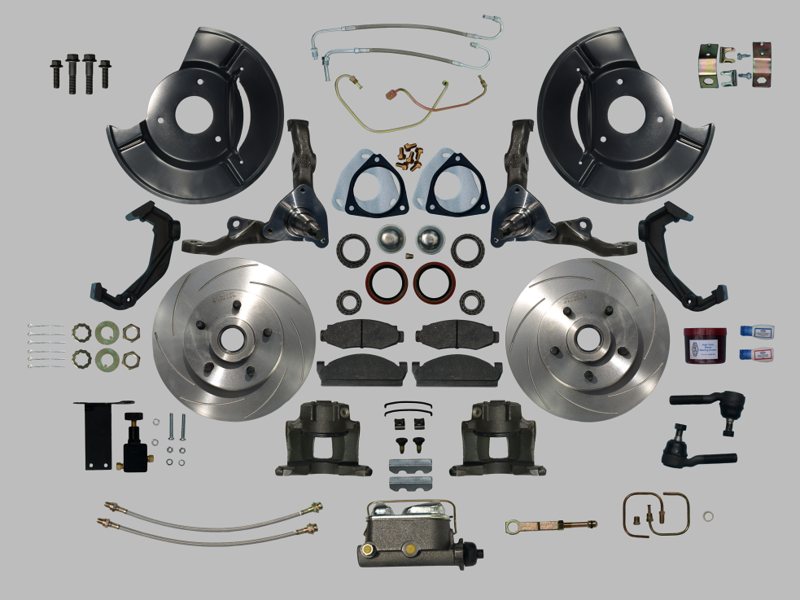 The 67.PBU power brake upgrade kit has all new parts including a Bendix brand booster, bracketry, power master cylinder upgrade, hose, power brake pedal push rod, power brake pedal, and hardware. The kit can only be applied to 67-70 automatic transmission equipped cars. It can be used on manual transmission cars if the installer is willing to modify the metal pedal pad on the brake pedal (we would provide a manual rubber pad). This kit is shipped with no additional S&H charge when purchased with a SWAP kit.